Get to know your prototyping tool workspace. 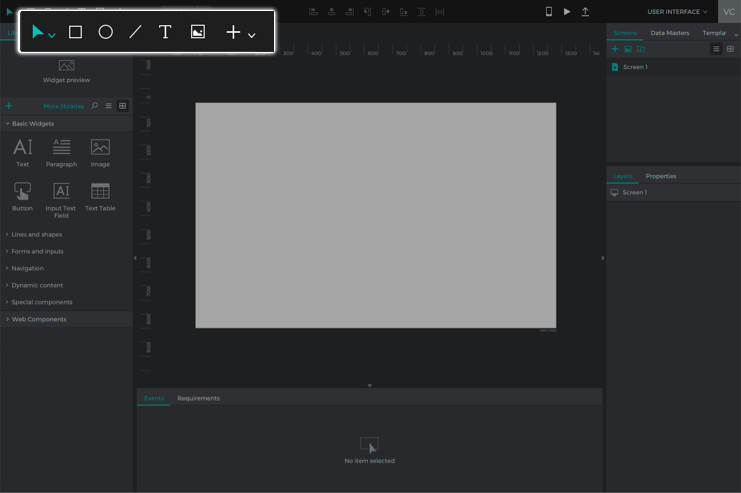 The toolbar contains quick editing options for the selected screen UI element. You’ll find the most common and frequently-used tools and commands. Here you can switch between different modules (such as User Interface, Comments and Scenarios) depending on what you want to do with your prototype. There are five different main modules: User Interface, Comments, Site Map, Scenarios and Requirements (the Requirements module is only available for Justinmind Enterprise users). 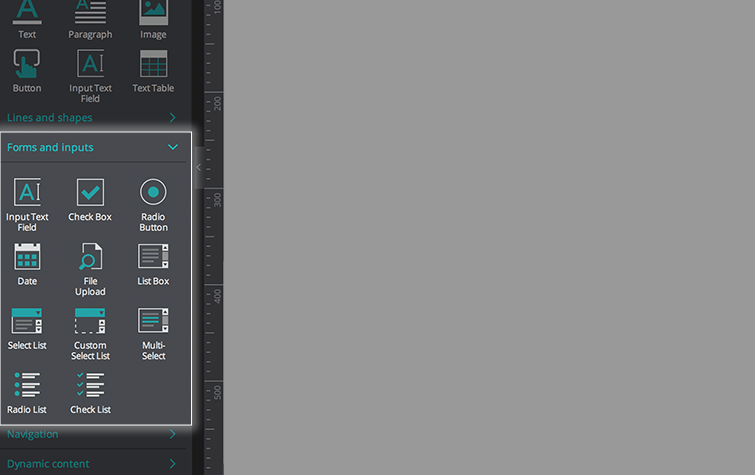 When the editor display is maximized, the modules are displayed horizontally at the top of the editor. If the editor display has been reduced, the modules will be displayed in a drop-down menu. 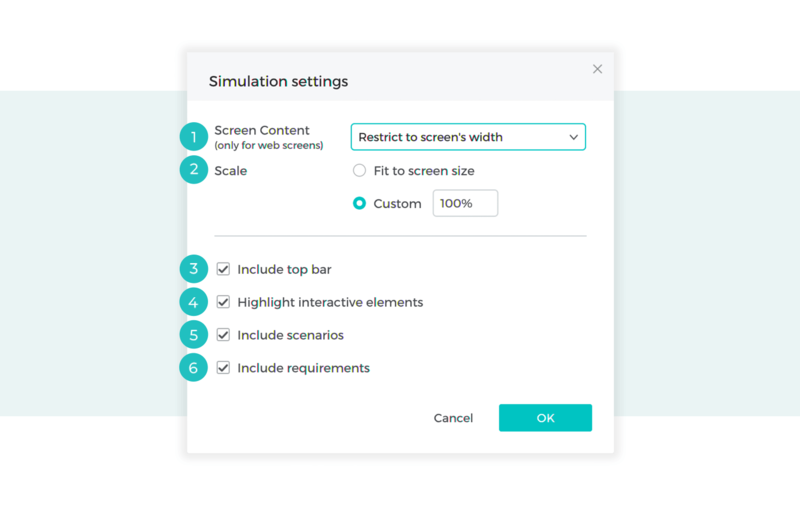 Screens palette – the Screens palette lists all the screens in your prototype. 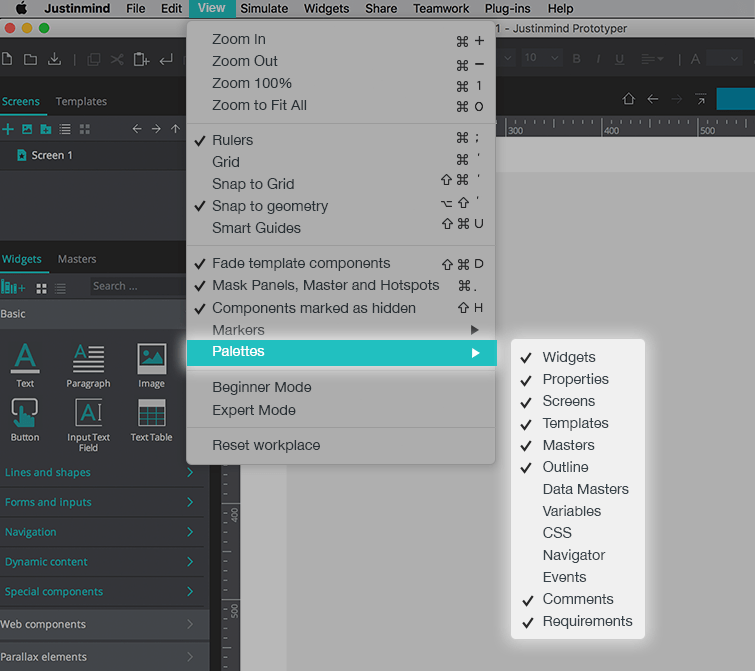 Templates palette – the Templates palette lists all the templates included in your prototype. To learn more about prototyping with templates, click here. Widget library palette -the Widgets palette contains pre-built widgets that you can use to create your prototype’s content. Simply drag and drop them to the canvas, or click on a widget and then click on the position in the canvas where you want to place it. Masters palette – the Masters palette lists all the Masters included in your prototype. To learn more about prototyping with Masters, click here. Screens on the canvas – at the top of the canvas, you’ll see a tab for each screen within your prototype. These are useful for jumping between screens quickly. The selected tab is the active one in the canvas. Canvas – the canvas is where you will design your prototype’s screens, templates and masters by dragging widgets onto them. It displays the active screen, template or master. 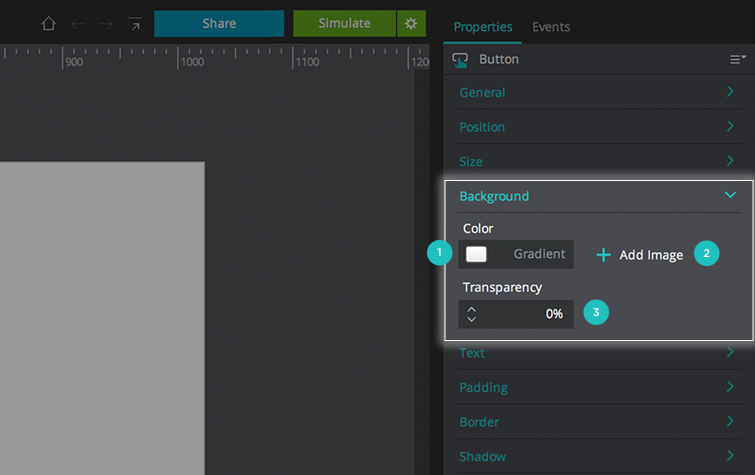 Properties palette – You can edit the properties of the selected UI element (e.g. name, color, border, font, position) in the Properties palette. Events palette – the Events palette is where you can add functionality to your UI elements and screens. Learn more about creating events in your Justinmind prototypes here. CSS palette – from the CSS palette, you can copy the styles of UI elements (default or customized styles), including width, height, font family, size, weight and color to other design tools or programs. You cannot modify any content from the CSS palette. To edit properties, revisit the Properties palette (7). 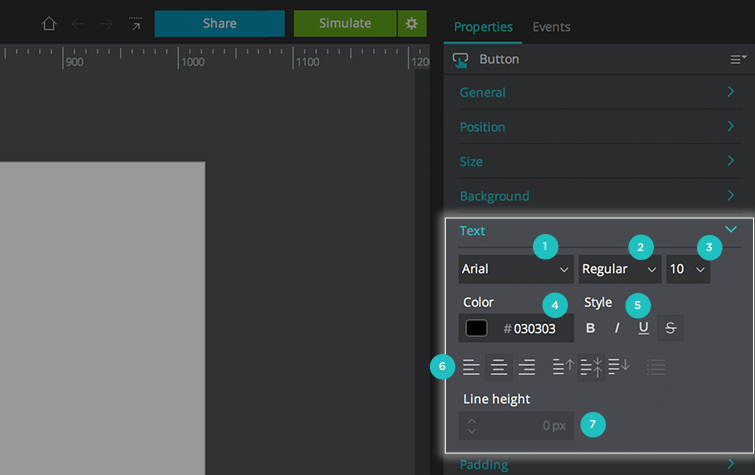 Outline palette – the Outline palette displays all UI elements in the selected screen. Data Masters palette – a list of your prototype’s Data Masters can be found here. Learn more about working with Data Masters and data-driven prototyping here. Variables palette – a list of your prototype’s Variables can be found here. Learn more about working with Variables here. Comments palette – the Comments palette lists all comments for your prototype. Learn more here. Requirements palette – the Requirements palette lists all requirements for your prototype. Learn more about working with Requirements here. You can arrange your Justinmind editor as preferred by moving the floating palettes into different docks around the workspace. The target dock is highlighted in blue. You can also drag a palette to a space unoccupied by a dock. Expand and collapse floating palettes with the arrows in the top right-hand corner of each palette. Collapsed palettes will leave you more room to work in. Your customized workspace will remain intact the next time you open Justinmind. To reset your workspace, choose the “Reset workspace” from the “View” main menu option. You can also show and hide any of your floating palettes from the “View” main menu option. The Screens palette lists all the screens in your prototype. You can add, delete and manage screens in the Screens palette. Click to apply template style of the applied template to your screen. Learn more here. Click to categorize the screen. Choose from the following: Completed, To change, Discarded, None. Basic widgets are widgets that are commonly found in all devices, and are pre-loaded in the Widget library palette. They include: Lines and shapes, Forms and inputs, Navigation, Dynamic content, Special components widgets. Text – a simple text box widget that holds a single line of text. You can only apply a single style to the text within this text box. Paragraph – an advanced text box that allows you to enter multiple lines of text. You can apply different styles to the text within this text box. Note that when a widget is placed on the canvas, it will be referred to as a “UI element” (or simply “Element”) going forward. Double click on the element on the canvas and enter the desired text. Then, enter “Enter” on your keyboard or click outside the element to save your changes. To cancel changes, enter “Escape”. You can also select the element and change its default text in the Properties palette. Image – displays the image file that you have selected from your folders. Justinmind supports the following image file formats: BMP, JPEG, GIF, PNG and SVG. Drag the Image widget to the canvas, double click it and select the desired image from your computer. Learn more about working with images in your prototypes here. 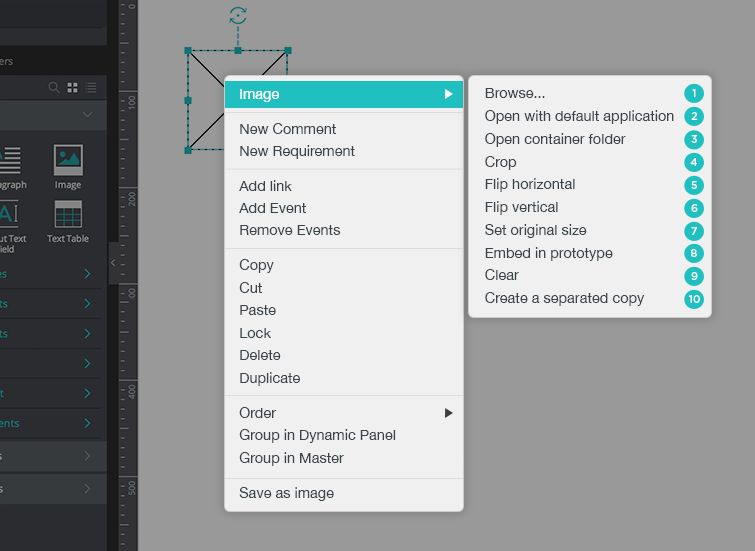 When you have an image in your prototype, you can perform multiple operations with it. If you view the context menu from an image component, you can find some image-only commands. Crop – click to adjust the bounds of the image file. Note that a linked images will need to be re-linked upon cropping. Flip horizontal – click to invert the image over the X axis. Note that a linked images will need to be re-linked upon inverting. Flip vertical – click to invert the image over the Y axis Note that a linked images will need to be re-linked upon inverting. Clear – click to remove the image file displayed. The image placeholder (that appears by default when you place an Image widget on the canvas) will replace your image file until you select another. If you have a linked image from a network drive or an external device, and you lose the connection, or if you delete the image file from your file system, Justinmind won’t be able to refresh your image. The last update will remain. A warning symbol in the top left-hand corner of your image will alert you to a broken link. Once the connection is restored, or the image has been put back into its original folder, the icon will disappear and the image will be updated. When an image is added to Justinmind, it won’t lose quality, even when resized. Retina images will maintain retina quality on a retina display. You can save any image added to Justinmind in your local folders. Save SVGs as PNG files if you want the images to retain their color properties. Button – a button/label widget that holds a single line of text. Modify it in the same way as Text and Paragraph elements. Text Table – organizes text in rows and columns. It is made up of cells, each behaving like the Paragraph element. When a Text Table is dragged to the canvas, it has three rows and three columns by default. To select a row or column, click on the left edge of the row/top edge of the column when the cursor displays a right-pointing arrow or a down-pointing arrow. To edit a cell’s text, double-click on the cell to start editing. Make the desired changes and click outside the element to apply the changes. Or, enter “TAB” to start editing the next cell. To cancel changes, enter “Escape”. You can also select the cell and change its default text in the Properties palette. To edit the style of text within a cell, double-click on the cell to start editing. Highlight the text range you want to edit using the cursor, make the desired changes in the Properties palette or from the toolbar. Apply the changes clicking outside the cell or cancel them, entering “Escape”. To insert new rows or columns, select the Text Table element in the Outline palette and select “New Row” or “New Column” from the menu. Alternatively, you can change the number of rows and columns in the Properties palette. New rows will be added under the last row and new columns on the right of the last column. New rows and columns can also be inserted between other rows or columns. To insert a new row between two other rows, select and right click on a row on the canvas and select “New Row”, and then either “Insert Row Below” or “Insert Row Above” from the menu. To insert a new column between two other columns, select and right click on a column on the canvas and select “New Column”, and then either “Insert Column Left” or “Insert Column Right” from the menu. To remove cell content, delete the text within a cell or group of cells, select the cell(s) and enter the “Delete”. To remove rows and columns, select them and right click on the selection them. Then, select “Delete” from the menu. To resize rows and columns, simply drag their borders. To resize a row, drag its lower border when the cursor displays a vertical double-headed arrow. To resize a column, drag its right border when the cursor displays a horizontal double-headed arrow. To resize an individual cell, select it, drag its sizing handles located at the bottom right-hand corner, right edge or bottom edge. Alternatively, select the cell and change its measurements in the Properties palette. You can split cells into two parts of equal size, either horizontally or vertically. If a cell is split vertically, the cell is divided into different cells, half the width but same height. If a cell is split horizontally, the cell is divided in two different cells, half the height but same width. To split a cell, right-click on it and select the “Split Cell Horizontally” or “Split Cell Vertically” from the menu. Then select a table cell and select Split Horizontally or Split Vertically in the Table menu. A set of contiguous cells can be mergedinto one cell. When a group of cells is merged, their content is also merged in the new cell. To merge cells, select them and make sure they all share at least one edge, then right-click on any of the selected cells and select “Merge Cells” from the menu. You can copy content from a row, column or individual cell(s) to another section of your Text Table element using the standard copy/paste operations. To copy a set of cells, first select them using the “⌘” or “Ctrl”. Alternatively, you can copy and paste cells to a location outside the Text Table. A new table will be created using the copied cells, with identical content and properties. To change the default state of the Check Box, either double click on it in the canvas or change it in the Properties palette. To change the state of the Check Box during simulation, simply click it once. Change the Radio Button’s default state in the same way as with the Check Box. Unlike the Check Box, you can’t change the state of a Radio Button during simulation once checked. Events must be used to change a Radio Button’s state, as they usually work together with other Radio Buttons. To edit the default value of this widget, double-click inside the input text field. A dialog with a calendar/digital watch page/both will appear (depending on which value type you have selected). Enter the desired date/time/ date and time and click “OK”. During simulation, click on the element to edit it. File Upload – allows the user to select and upload a file from their folders. It is displayed by an input text field with a Browse button on the right-hand side. The text held within this widget cannot be changed directly. To add a file to the File Upload element during simulation, click on Browse button and select the desired file from your folders. Select “Open” to use the path to the selected file. List Box – displays a list of values. Only one value can be selected at a time. You can edit the values of the Select List element in the Properties palette, by clicking the “Edit values” option. To set the default selected value, double-click on the desired value from within the element on the canvas. You can also change the default value in the Properties palette under “Value”. To select a value from the List Box widget during simulation, click on the desired value from within the element. To set one of its values as default, double-click on the desired value from within the element on the canvas. You can also change the default value in the Properties palette under “Value”. To select one of its value during simulation, simply click once on the element and select a value from the drop-down. Note: the properties of the Select List cannot be customized. How this element is displayed during simulation depends on the device. For instance, devices that operated with Android will display drop-down menus. You can edit the values of this element in the Properties palette, by clicking the “Edit values” option. To set one of its values as default, click on the element in the canvas and select a value from the drop-down. You can also change the default value in the Properties palette under “Value”. Multi-select – a multi text line widget that displays a list of values. More than one value can be selected at a time. To set the default value(s), double-click on the desired value(s) from within the element on the canvas. You can also change the default value in the Properties palette under “Value”. To select/de-select a value during simulation, simply click on the value(s). Remember that you can select as many values as you like. Radio List – a single selection widget that displays a list of values, each with its own radio button. Only one value can be selected at a time. Change the orientation in the Properties palette under “Orientation”. To set the default value(s), double-click on the desired value from within the element on the canvas. You can also change the default value in the Properties palette under “Value”. To select/de-select a value during simulation, simply click on the value from within the element. Once on the canvas, double-click on the Button to start editing its text. Alternatively, you can select the Button and change its default text in the Properties palette. Hotspot – acts as a clickable area and is used to define events. The Hotspot is placed on top of other UI elements in the canvas and allows you to add events to specific spots within a screen. It appears as a faintly-green rectangle on the canvas and is transparent during simulation. Once on the canvas, two root Tree Nodes and one sub-node inside the first will appear by default. 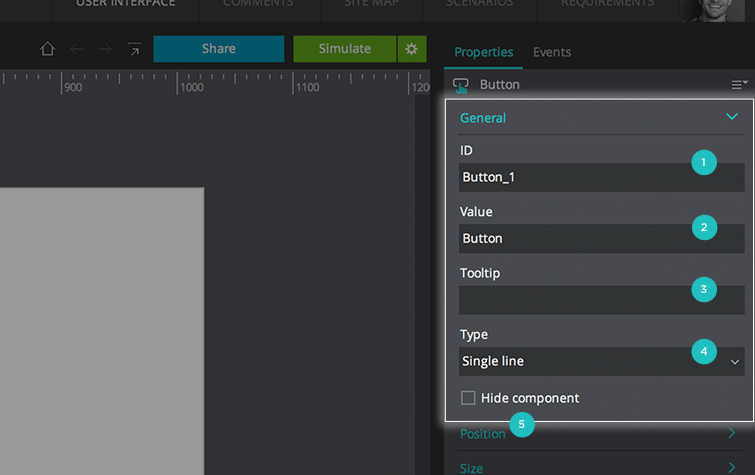 Customize the nodes in the Properties palette with the “Expand” and “Collapse” options. Tree Node – nodes that can be added to a Tree UI element on the canvas. To add a Tree Node to a Tree, drag and drop it on top of the Tree in the canvas. Give the node a name in the dialog that appears dialog and click “OK”. 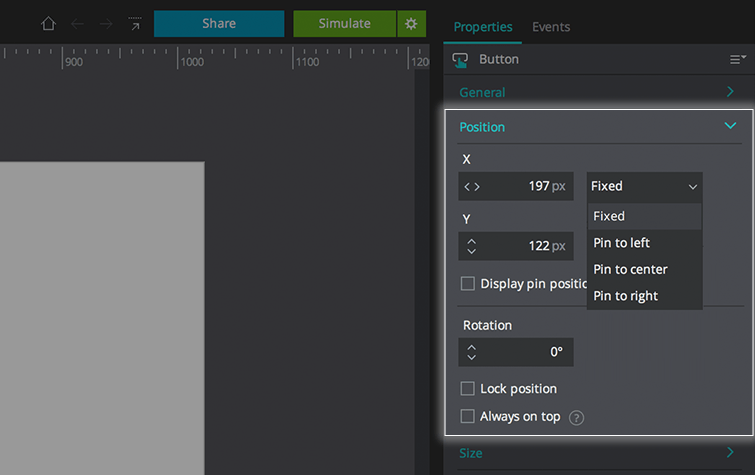 To add a subnode, drag and drop a Tree Node widget on top of another Tree Node within the Tree element on the canvas. A green line will guide you when placing the new node. Give the node a name in the dialog that appears dialog and click “OK”. To remove a node, select the node you want to delete on the canvas. Enter “Delete” on your keyboard or right click on the node and select “Delete” from the menu. The order and hierarchy of nodes can be changed once they’ve been created. To change a Tree Node position within a Tree, drag and drop them into place. A green line will guide you when placing the new node. To edit a Tree Node’s text, select the node you want to modify and go to the Properties palette. Select “Value” to make the desired changes. To change a Tree Node’s icons, each tree node can display a different icon to help the user determine when they have been expanded or collapsed. These icons can be assigned through the Properties palette. To do so, select the Tree Node on the canvas and go to the Properties palette. Click the ‘+’ icon next to the “Expand”/ “Collapse” option to choose an icon from your folders respectively. Menu – used to create basic fly-out menus. Like the Tree widget, Menu widgets are made of items (Menu Item widgets) also organized in a hierarchical structure. Horizontal: Like a main menu of a desktop application. Vertical: Like a sidebar menu. Menu Item – a Menu Item widget can only be created inside an existing menu widget. To add a new Menu Item to a Menu, drag and drop a Menu Item widget on top of a Menu element on the canvas and place it as desired. A green line will guide you when placing the new node. Give the item a name in the dialog that appears dialog and click “OK”. You can also add items within a Menu Item by right clicking on the Menu Item in the canvas and selecting either the “Add Menu Item After” or the “Add Menu Item Before” from the menu. To add a new item as a sub menu of a Menu Item, drag and drop a Menu Item widget on top of another item element on the canvas and place it as desired. A green line will guide you when placing the new node. Give the item a name in the dialog that appears dialog and click “OK”. You can also add sub menus to a Menu Item by right clicking on the Menu Item in the canvas and selecting “Add Submenu” from the menu. To remove items, select the item you want to delete on the canvas. Enter “Delete” on your keyboard or right click on the node and select “Delete” from the menu. To move items, the order and hierarchy of items can be changed once they’ve been created. 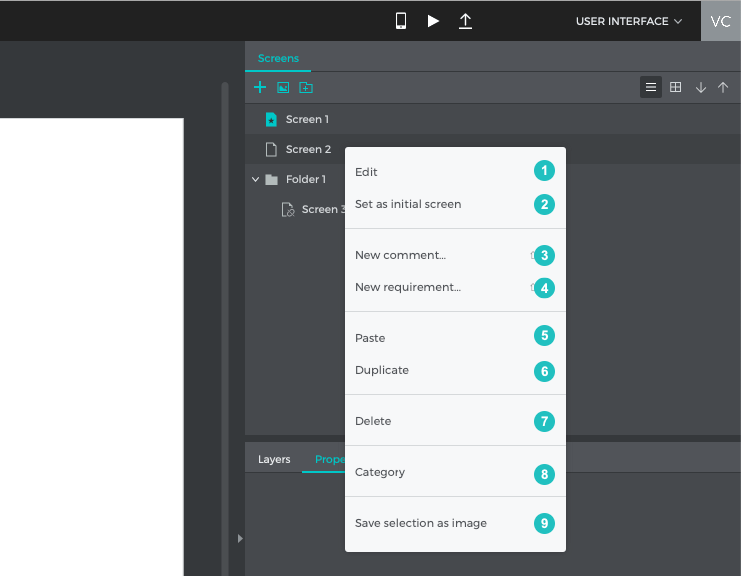 To change a Menu Item position within a Menu, drag and drop them into place. A green line will guide you when placing the new node. To edit an item’s text, to change the text displayed by a menu item, first select the item you want to change and then edit its text in the “Value” field in the Properties palette. To change a Menu’s orientation, change the orientation in the Properties palette under “Orientation”. To change an item’s icon, each item can display an icon. These icons can be assigned through the Properties palette. To do so, select the Menu Item on the canvas and go to the Properties palette. Click the ‘+’ icon on the left of the “Add Image” option to choose an icon from your folders. Dynamic Panel – an advanced container widget. In a prototype’s screen it holds other UI elements. Learn more about the Dynamic Panel widget here. Learn more about the Dynamic List widget here. 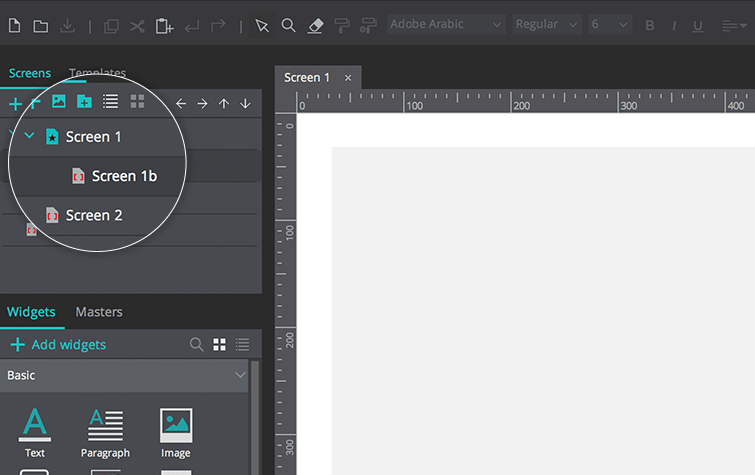 Learn more about the Dynamic Grid widget here. This widget cannot be directly edited as its content is associated with Records from a Data List or Data Grid. To change its associated Data List/Grid, drag it to the canvas, go to the Properties palette and select the desired Data List/Grid from the “Data Grid” option. Like the Summary widget, the Index widget cannot be directly edited as its content is associated with Records from a Data List or Data Grid. Once dragged to the canvas, the Index element will display the number of indexed pages of Records in a Data List/Grid. The current page index will be highlighted in bold. 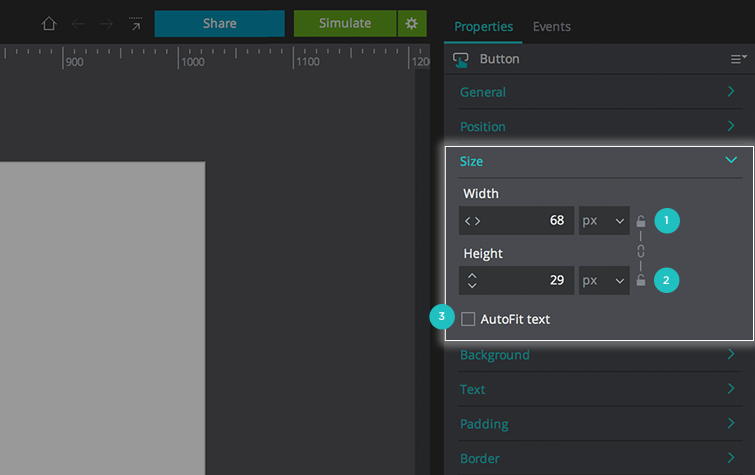 Learn more about using Summary and Index widgets in Data-driven prototyping here. The Table widget forms a grid or table that can hold other UI elements such as text boxes, paragraphs and images. When dragged to the canvas, the Table element has two rows and two columns by default, though these can be modified in the Properties palette. To select a row, click on the left edge of the row when the cursor displays a right pointing arrow. To select a column, click on the top edge of the column when the cursor displays a down pointing arrow. You can also right-click on a cell in the desired column and select the “Select Column” option from the menu, or select a cell in the desired column and select the “Select Column” option in the Table menu. Rows or columns can be added to existing ones. New rows will be added beneath the last row and new columns on the right of the last column. To add a row or a column, right-click on the Table element in the canvas and click the “New Row” or “New Column” option from the menu. Click the “Insert Row Below” or “Insert Row Above” option from the menu. To insert a new column between two other columns, right-click on a column in the Table element and click the “Insert Column Right” or “Insert Column Left” option from the menu. You can also select the Table element and change the number of rows/columns in the Properties palette. Delete a column or row by selecting it and entering “Delete” on the keyboard, or right-clicking on the selection and selecting “Delete” from the menu. Column width and row height can be changed by dragging their borders. To resize a row, drag its lower border when the cursor displays a double-headed arrow. To resize a column, drag its right border when the cursor displays the double-headed arrow. Individual cells can also be resized. Changing the size of a cell will automatically modify the size of the corresponding column and row to fit the new cell size. To resize a cell, select the table cell, and drag its sizing handles. These are located at the bottom right-hand corner, right edge or bottom edge. You can also select the table cell and specify its size in the Properties palette. When dragged to the canvas, the HTML element displays the following text by default: “The content of the body element is displayed in your browser”. Copy the HTML code from the source. 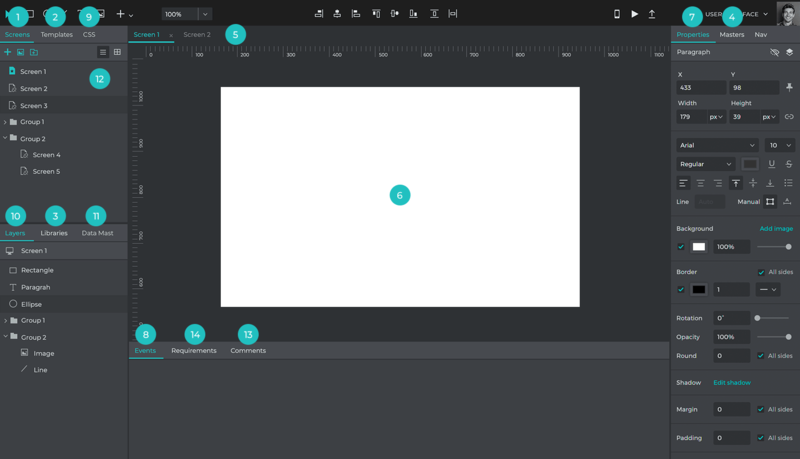 Drag an HTML widget to the canvas. Go to the Properties palette and paste the HTML code into the HTML field. Click outside the Properties palette to apply the changes. URL – displays a web page by embedding the webpage’s URL When dragged to the canvas, the URL element displays Justinmind’s homepage by default. Copy the URL from the source. Drag a URL widget to the canvas. Go to the Properties tab and paste the URL into the URL field. Click outside the Properties tab to apply the changes. Document – displays external text documents. It supports PDF, TXT and XML files. When dragged to the canvas, the Document element displays a PDF file as an example by default. Flash – displays Flash files When dragged to the canvas, the Flash element displays a flash file as an example by default. Drag the Flash widget to the canvas. Click on the Browse button in the “File” option of the Properties palette and select the desired flash file. Change the input parameters, the quality, scale and wmode, using the parameters table under the “File” option. Click on the HTML Website widget in the Widgets library. A dialog will appear. From the “Select a directory” field, select the website folder (the folder where all the site files e.g. HTML, images, CSS, etc. are contained). From the “Choose an entry file” field, select an initial HTML file, usually the index.html. We recommend that this file be located inside the folder selected in the previous step. Click “OK” and click within the canvas to create the widget. To add and manage your Widget libraries, go to the Widgets library palette. From the top left-hand corner, click the “Book” icon to be taken to the “Manage Widget Libraries” dialog. This dialog contains all your available libraries, including the ones you’ve created. From this dialog, you can add Widget libraries to and remove Widget libraries from Justinmind’s editor. Learn more about managing your Widget libraries here. You can group two or more UI elements together on the canvas and treat them as a single UI element. 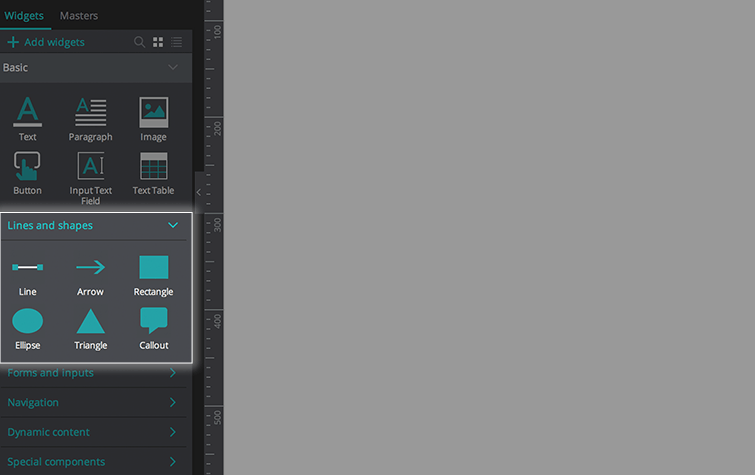 To do so, drag and drop two or more widgets onto the canvas. Then, right-click within the selection and select “Group” from the menu, or enter “⌘” or “Ctrl” + “G”. To create a group within the original group, select your group and the additional UI element(s). Right click on within the selection and select “Group” from the menu. Go to the Outline palette. You should now have an additional group within your original group. To add this UI element to the original group, go to the Outline palette. Select the element you want to add to the group and drag it into the group. To remove a UI element from a group, go to the Outline palette. Select the element you want to remove from the group and drag it out of the group. The canvas is where you will design your prototype’s screens, templates and masters by dragging widgets onto them. It displays the active screen, template or master. 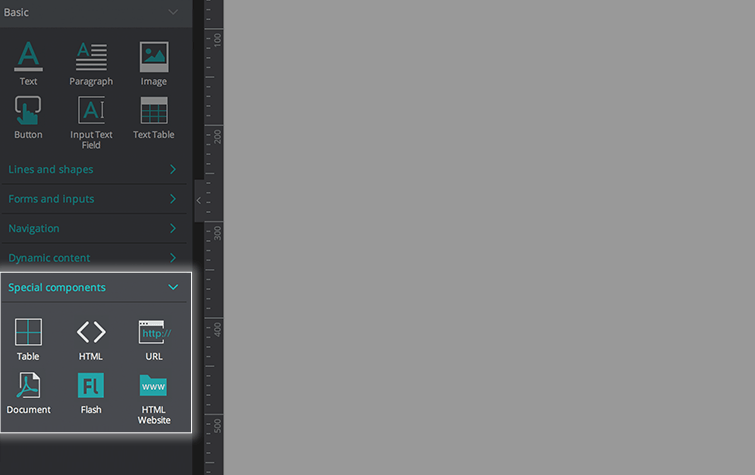 You can zoom in and out of the canvas using the drop-down in Justinmind’s toolbar. 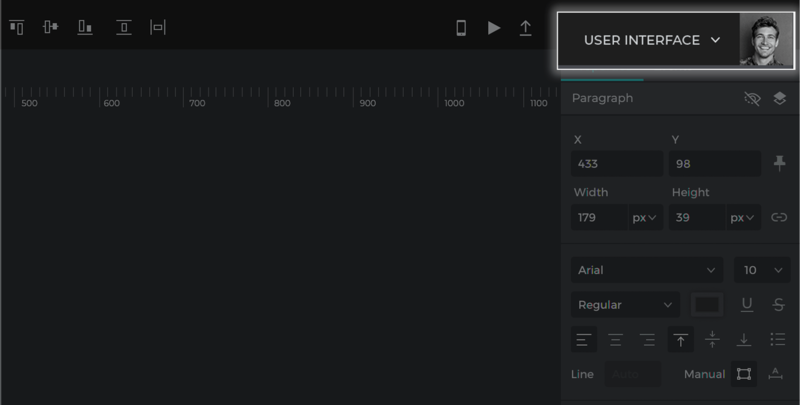 Rulers – help you position UI elements on the canvas. They are displayed around on the top and left of the canvas show the height and width of the canvas in pixels. Rulers are displayed by default, but you can deactivate them in the main menu (“Preferences” > “View”). You can also choose how to measure the rulers: in Inches, Centimeters or Pixels (pixels is the default option). 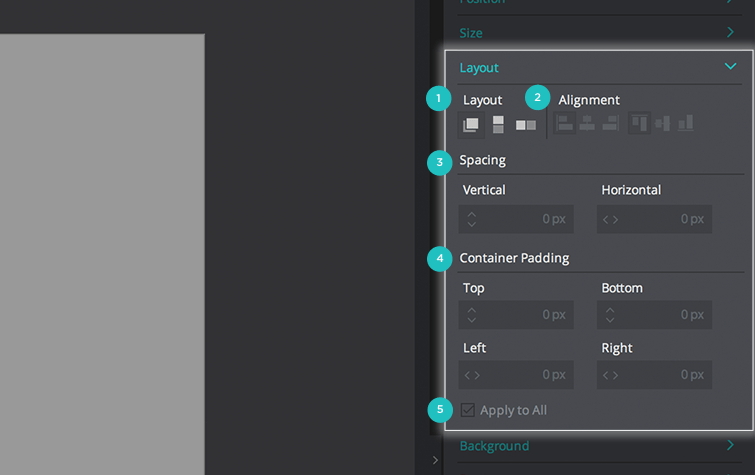 Guides – make it easier to position and line up elements in the canvas. To create a guide, click anywhere within the horizontal or vertical rulers. A new guide will be created. You can then drag the guise to the desired position on the canvas. To delete a guide, simply select it and enter “Delete” on your keyboard or right click on one of the guide’s handlers and select the “Delete guide” option. 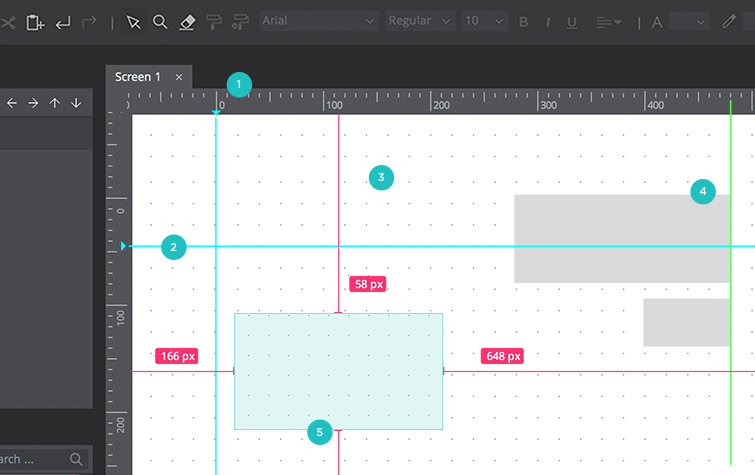 Grid – helps you structure and shape your design. When the grid is activated, a set of vertical and horizontal dots are displayed on the canvas background. The grid isn’t displayed during simulation. 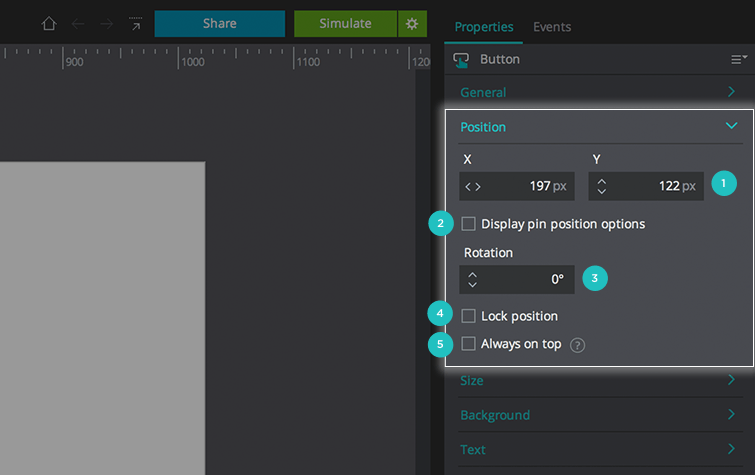 Select the “Snap to grid” option from the “View” option in the main menu, to enable UI elements automatically align with the nearest grid line. Hold the “Alt” key while dragging the widget to avoid snapping. Configure smart guides in the “View” main menu option. Smart Guides – pink guides that appear when you change the size of an element or drag it to a new location. They will show the element’s position on the canvas in pixels. Configure smart guides in the “View” main menu option. You can edit the properties of the selected UI element (e.g. name, color, border, font, position) in the Properties palette. These are styles that you define for elements associated to prototype templates. Learn more about these options here. Here’s an overview each sub-section of the Properties palette. 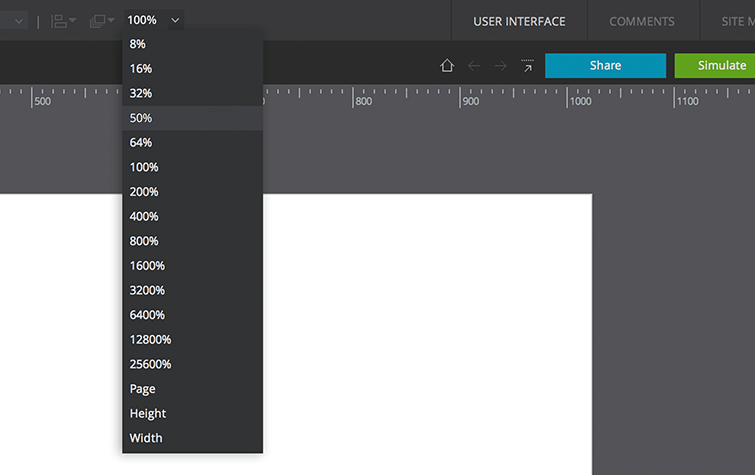 To start modifying a UI element, select it on the canvas and go to the Properties palette. Note: properties may vary depending on the selected UI element. Note that different UI element will have different General settings, including Autofit, Data Field and Add Image. 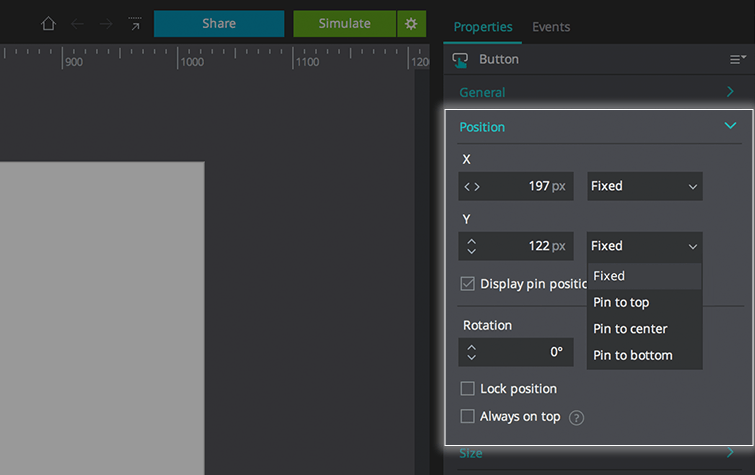 For the X position, you can choose from the following options: Fixed, Pin to left, Pin to center and Pin to right. For the Y position, you can choose from the following options: Fixed, Pin to top, Pin to center and Pin to bottom. 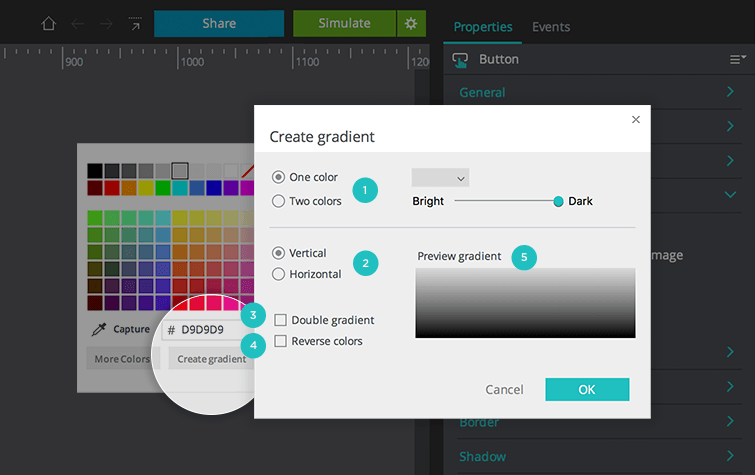 Color – click to change the background color using the drop-down or directly entering in the HEX code. You can select a color or gradient. See more in the “Creating a gradient” section below. Border color – select the color of your border. Tick the check box above to apply the same style to all border edges. 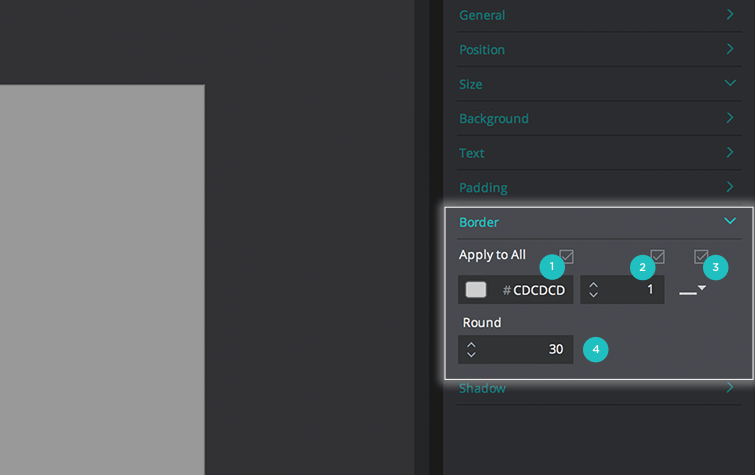 Border width – define the width of the borders with the spinners provided. Tick the check box above to apply the same style to all border edges. Border type – select the line type from: none, solid, dotted or dashed. 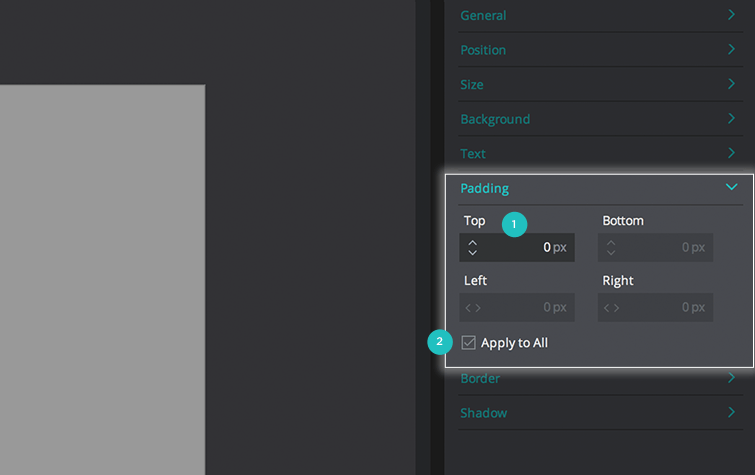 Tick the check box above to apply the same style to all border edges. Round – define the roundness of the element from 0-100 with the spinners provided. 0 will display sharp borders and 100 will display fully rounded borders. Box shadow properties – modify the angle, distance, color, blur radius and spread of the box shadow. Check “Use Global Light” to ensure shadows are cast in the same direction. 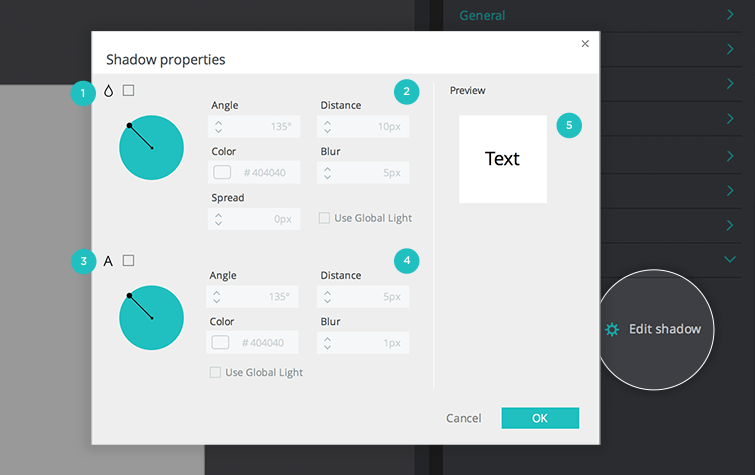 Text shadow properties – modify the angle, distance, color, and blur radius. Check “Use Global Light” to ensure shadows are cast in the same direction. 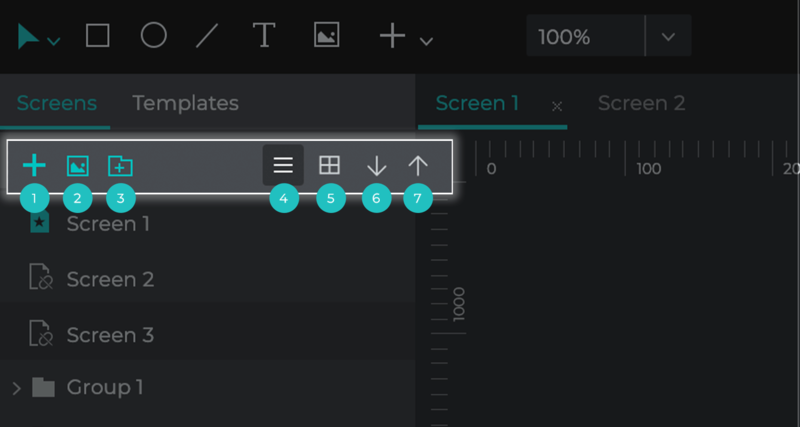 From the Outline palette, you can modify the names of UI elements in the selected screen, template or master, change their order and group them together from the Outline palette. Click the “Eye” icon next to a UI element to hide it on the canvas. Click it again to make it reappear. Drag the “Eye” icon across multiple elements in the Outline palette to make them disappear or appear. Click the “Lock” icon to lock or unlock each UI element in the Outline palette. When locked, UI elements cannot be moved around the canvas or resized. 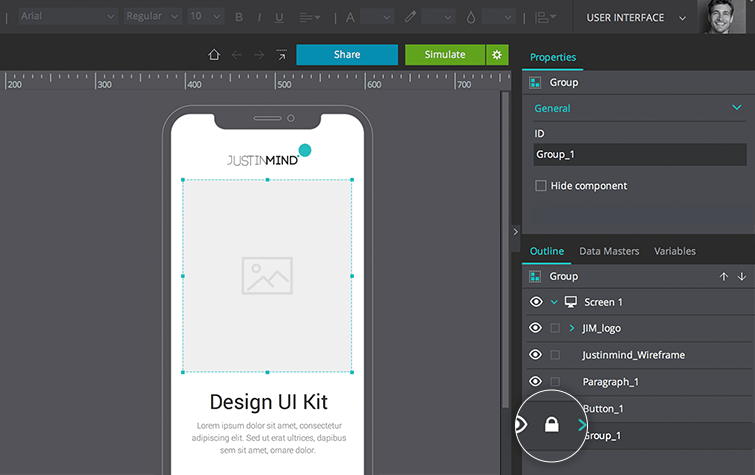 With Justinmind, you can visualize how your website or mobile app is going to look on different devices directly from your browser. If you click on the “Simulate” button in the top right-hand corner of the User Interface module, the simulation window will appear. The current screen in the canvas will be displayed in the simulation window. Include top bar – click to include top bar in simulation mode. The top bar includes options related to comments and allows you to navigate between different screens.